I’ve seen a lot of lasagne recipes out there using zucchini instead of noodles and I’ve always been intrigued. What I couldn’t find though is one that was also dairy free. Being lactose intolerant I wanted to see if it was possible. Though I’ll admit it isn’t quite the same as bitting in to some starchy noodles it is still really really yummy. I also noticed that once I let it sit in the fridge over night and then reheated it for lunch today that it tasted even more amazing. 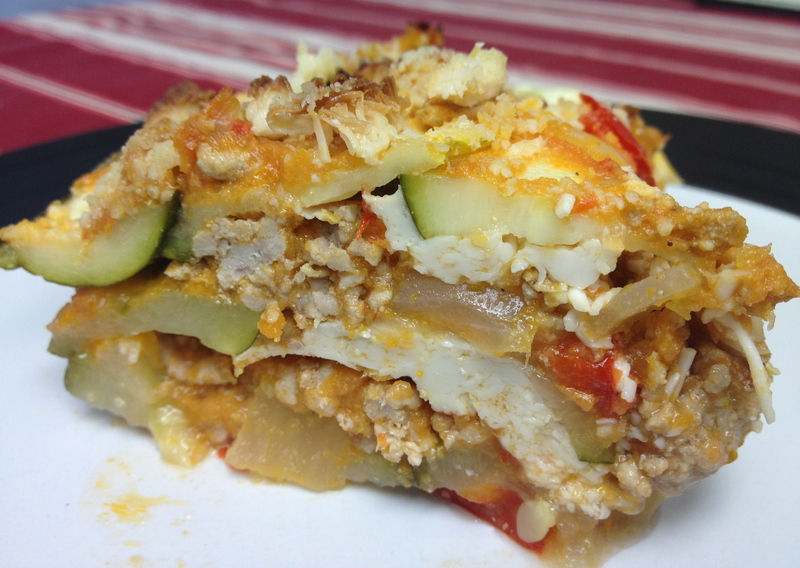 So wether you call it a noodle-less lasagne or a zucchini casserole I still say it is pretty delicious. Slice the zucchinis lengthwise in thin strips. Lay out flat and sprinkle with salt. Set aside while you prepare the filling. In a medium sauce pan, brown the ground pork in olive oil on medium heat. Once the meat is cooked, remove from the heat and drain any excess liquid. Dice the onion, and both the sweet and hot peppers. Add the vegetables to the saucepan with the browned meat. Continue cooking on medium heat for approximately 5 minutes. Add in the spaghetti sauce and allow to simmer for approximately 5 minutes. In a deep dish begin to assemble your lasagne. Since your zucchini noodles won’t be uniform you may need to overlap them in places or turn some of them sideways to properly fill the dish. Start with a layer of the meat sauce, followed directly by a layer of zucchini. Then follow with another layer of meat, a layer of grated cheese and then zucchini. Repeat the meat, cheese, zucchini pattern again. Top the last layer of zucchini with a small amount of meat sauce, a sprinkling of cheese and (if desired) a few tablespoons of almond flour to make the top crispy. Preheat the oven to 175 C (350 F) and bake for 45 to 60 minutes. You want your zucchini to be nice and soft like noodles, but not falling apart. Enjoy! Cool dairy-less recipe. I feel like I gain five lbs every time I eat cheese. haha 🙂 I’ll be trying this soon!